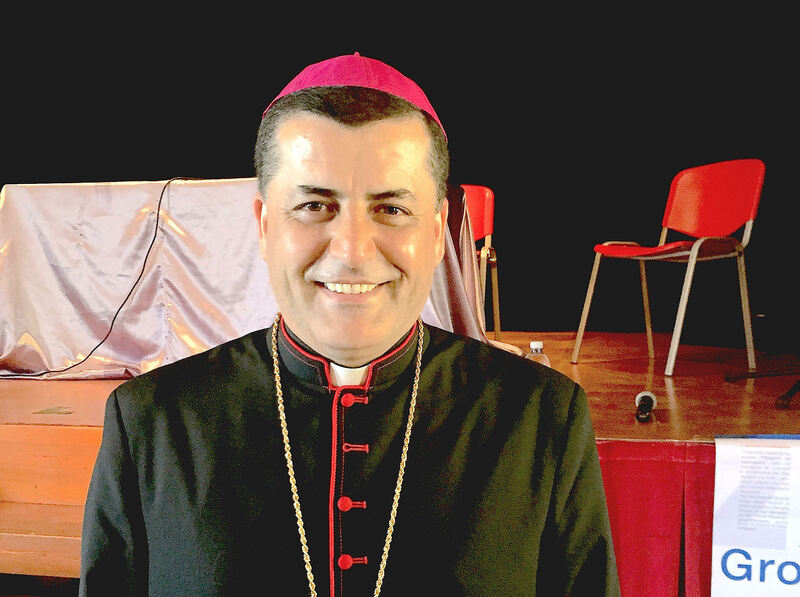 An extraordinary testimony of Christian faith in a time of persecution was given at the end of the meeting “Pellegrini nel Cyberspazio” (Pilgrims in Cyberspace) (Grottammare-Ascoli Piceno, June 18-20), by Bishop Basel Yaldo, Auxiliary Bishop of the Chaldean Patriarchate of Baghdad for the past five months. The Prelate asked the journalists in the hall “to make the whole world hear the voice of a suffering Church.” He then talked about his abduction in Baghdad in September 2006, in an overheated atmosphere, following Pope Benedict XVI’s famous address, completely misunderstood in many sectors of Islam. Having gone to clarify the controversy with a group of Muslims, the young priest was attacked and held prisoner for three days, during which his only consolation was the recitation of the Rosary. “They told me that they would release me on the condition that the Pope apologized and I answered that they had not understood his message. Their reaction then was: ‘shut up!’” Bishop Yaldo said. Forty-five years old and a native of the Plain of Nineveh, Bishop Yaldo moved with his family to Baghdad at the age of 7 where, after graduation, he entered the Major Seminary. After obtaining a Degree in Theology in 2002 from the Pontifical Urbaniana University, he was ordained a priest in Rome on November 23 of the same year. After the fall of Saddam Hussein in 2003, Yaldo returned to Baghdad as Vice-Rector of the Seminary and secretary of the Patriarch of the Chaldeans. After the abduction, the priest left Iraq for security reasons, and went first to the United States, then back to Rome, where he obtained a Doctorate in Dogmatic Theology. He returned to Baghdad in February, 2015, in the capacity of Auxiliary Bishop. In conversation with ZENIT, Bishop Yaldo talked about his pastoral experience, launching a great message of peace. ZENIT: Your Excellency, what is your memory of the kidnapping you suffered nine years ago? Bishop Yaldo: It happened in September 2006, shortly after Pope Benedict XVI’s address at Regensburg, which sparked harsh controversies and also violence among Muslims, also in our country. In that circumstance, many priests were kidnapped: a fate that also touched me, when I was secretary of the Patriarch of Baghdad. It was an experience that gave me the strength to deepen my faith. I remember that they took away all my personal objects: documents, money, briefcase, watch, cell phone. They left me only a small Rosary. The abduction began on Saturday and ended on Monday. So, on Sunday, I was unable to celebrate Mass, because I had my hands tied behind my back. So I limited myself to praying with that Rosary, asking the intercession of the Virgin Mary. When they released me, I received this as a miracle! I thank the Lord that my abduction lasted only three days. ZENIT: With what spirit did you live your return to Iraq at the beginning of this year? Bishop Yaldo: Baghdad is the city where I grew up and I am very bound to it. Therefore, I was happy to return at this difficult time to show our faithful that we are close to them in suffering. We must think of our community and, in particular, of the poorest, to make them understand that they are not alone. This spirit of solidarity gives me the strength to serve more. For me it is a true and proper mission and of call of God. I returned to Baghdad at the right moment to help the people who are suffering. ZENIT: How is it possible to live as Christians in a country like Iraq, in particular, when there is the need to forgive enemies? Bishop Yaldo: We Christians are a minority of 2-3% in Iraq. However, our exiguous presence is a good example for the whole of the country. Everyone in Iraq knows that Muslims are peaceful, loyal and faithful people. We have relations with all. No Christian in Iraq has ever killed for religious reasons or has [committed suicide bombing]. Our presence is very important. Therefore, we must be able to forgive following the example of Jesus Christ, our Teacher, and give good example to the others. ZENIT: How are you living your episcopal ministry? Bishop Yaldo: Every Sunday, I go to a parish to encourage the people, saying that we are united, that we are with them. Patriarch Sako and I are encouraging our faithful to stay in Iraq. . All our patrimony and history is in our land. In the vicinity of Baghdad we have three of the oldest Christian cities of the Middle East, mentioned also in the Scriptures: Nineveh to the North, Babylon at the center, Ur (where Abraham was born) at the South. We must give witness also with blood and, in the last years, our Church has become a Church of martyrs. ZENIT: What appeal would you like to make to the International Community? Bishop Yaldo: We ask the International Community to help us, so that this tragedy will end. We have dead every day in Iraq. One night in the North of the country 100,000 fled, leaving their land and their homes. They must help us not only at the material level: in the first place they must hunt the terrorists of ISIS. Therefore, we also ask the help of the Holy Father, given his influence among the powerful of the world. Pope Francis has shown great attention to the Iraqi people, sending several Cardinals to our country. The Prefect of the Congregation for the Evangelization of Peoples, Cardinal Fernando Filoni, came twice to visit the refugees; then the Archbishop of Lyon came, Cardinal Philippe Barbarin; the Prefect of the Oriental Churches, Cardinal Leonardo Sandri, finally, a few days ago, the Archbishop of Milan, Cardinal Angelo Scola. All this gives us courage and hope.